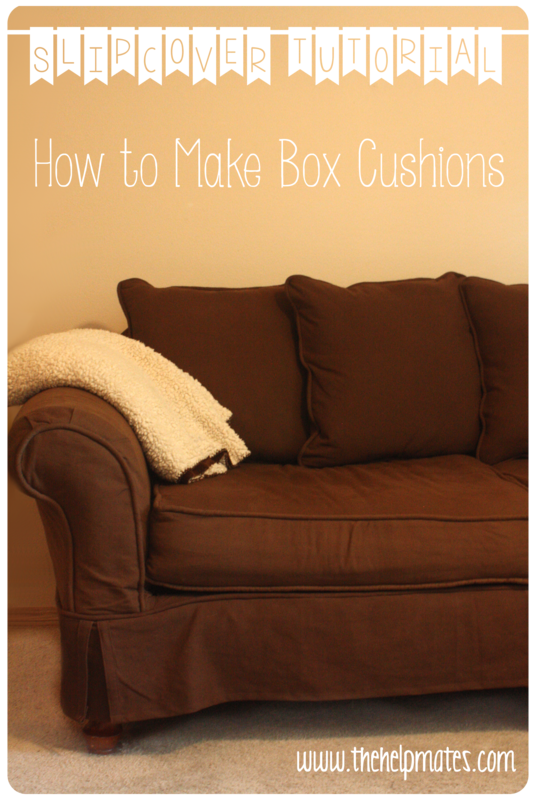 This is part 3 of my couch slipcover tutorial series. Go here for part 1 and part 2. Now that you’ve learned how to make piping and a zipper insert, you’re ready to make your box cushion covers! Nike decided that the old cover was her new bed. You’ll need two main panels for each cushion. Since my couch only has two cushions, I needed four panels. Lay the cushion on the fabric and use a fabric pencil to make an outline of the cushion. Here you can see the the outline. Cut around the outline, leaving a seam allowance. I recommend repeating these steps for the other three panels and not just using this panel as a template. The outline is very helpful in the next step. Here are two main panels and the zipper panels for one cushion. Starting just before one corner of the panel, pin on your piping. Make sure the cut edges of the piping and the cut edge of the panel are lined up, otherwise your piping will end up inside out. Place extra pins around the corners, since they’re tricky to sew. Now, since you started just before the corner, you should end up with your extra piping hanging off, as shown in the first image below. Image 2 – Use your seam ripper to rip open the piping. Image 3 – Cut the piping so that it will end up flush with the other end – don’t forget to tape before cutting. Image 4 – Then cut the piping fabric 2-3 inches from the end of the piping and fold the edge under. Image 5 – With the edge folded, encase the other end of the piping with the fabric. Image 6 – Now pin it down. Sew the piping to the panel using your zipper foot. Get as close to the piping as possible. This is what happens when you don’t get close enough to the piping when sewing it onto the panel. When tension is put on the fabric, it pulls away from the piping and you can see the original stitching from when you made the piping. Not a huge deal, but not the polished product that you’re probably going for. Now you have one panel done! Repeat this step for the other three panels. Check the fit of the panels with the cushion. You should be more worried about making it too big than too small. Measure the circumference and height of your cushion. Cut a strip of fabric the height of the cushion (with seam allowance) and the circumference of the cushion minus the length of your zipper panel (for zipper panel instructions, see Part 2). Cut one for your second cushion as well. For my cushions, I added a weird extra step. The zippers that I bought weren’t long enough (you need a zipper long enough to go across the back of the cushion and about 5 inches down each side). I suggest measuring your cushion before going to the store instead of eyeballing it like I did. Then, if the store doesn’t have any long enough, you can always buy a zipper roll and cut it to the length that you need. Anyway, here’s what I did to solve the problem. I cut a strip of fabric a foot long and a little over twice the height of my cushion. Since my cushion was about 7 inches tall, I cut it 18 inches wide. Image 1 – I took the zipper panel and on the end with the zipper pull, I turned under the edge of the extension piece and pinned it to the zipper panel on one side, lining the top of the panel with the top of the extension piece. Image 2 – Then I lined up the bottom of both pieces and pinned again. Image 3 – Now I have all the extra fabric in the middle. Images 4 & 5 – I sewed along the top, cut the threads, and sewed along the bottom. Image 6 – Now I have an accordion-like extension for my zipper panel. I ironed down the accordion piece. Then took the side panel (remember, the one that was cut for the circumference of the cushion minus the zipper panel), turned under the end of it, and sewed it across the other end of the zipper extension piece. IMPORTANT: If you aren’t doing this step because your zipper is long enough, you would just turn under the side panel piece and sew it to one end of the zippered panel. Pin your new side panel piece down, right sides together, to the main panel piece. Start just before the corner with the zipper end of the side panel. You’ll want to place a few pins to get around that first corner, but after that pins are fairly useless because of how the side panel will stretch as you sew. Sew around the main panel, stretching the side panel as you go. Don’t start sewing at the edge of the panel. Give yourself a few inches for when you finish up, and be sure to stop a few inches before you get to the end. Place the end underneath the zippered end and sew the two ends together. Also finish sewing the side panel to the edge of the main piece. It’s safe to check the fit of the cushion every few steps. And here’s the finished cushion cover! It fit pretty well, but I decided to go back and tighten it up a bit later. To do that, just put the cover on the cushion inside out, pin where it’s needed, and sew. Please let me know in the comments if anything in this tutorial is confusing, I’ll be happy to clear things up! Check back Friday for the next tutorial!